In 2005, Centre Harika was the first centre in the Middle East to start using this technology for prosthetics and orthotics. We are now at the forefront of innovation, with collaborations with specialists from Germany, France, Canada,… and the sole aim to improve the quality of prosthetics and orthotics and increase patient satisfaction. For many years, the custom fitting of prosthetic and orthotic (P&O) devices involved a manual plaster casting process that was slow, messy, and uncomfortable for the patient. 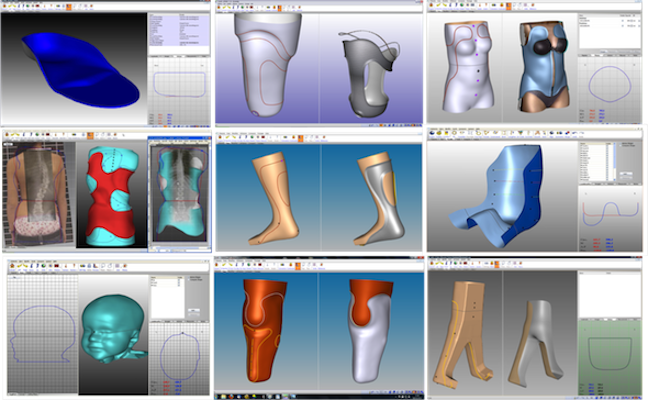 Modern Computer-aided Design and Manufacturing (CAD/CAM) replaces plasterwork with a digital solution that is much faster, more accurate, more pleasant for patients, and safer for clinicians. Several phases are involved in this process, starting with scanning the patient with the non-contact 3D optical scanners that capture the shape much faster and more accurately than plaster casts – without mess and discomfort. The shape is then transferred to a computer-based 3D design software tool that lets us quickly apply anatomical corrections to the scanned shape to create the desired form. This advanced software allows us to modify the shape in ways not possible with plaster molds. After all the modifications have been made, a high-speed carver automatically fabricates an accurate, lightweight foam mold for forming the prosthesis or orthosis.